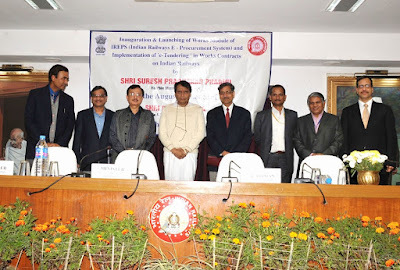 The application was inaugurated today by Hon'ble Minister for Railways Sh. Suresh P. Prabhu by publishing a tender on the IREPS portal. This Portal will enable railways to implement e-governance in Works Contract with facilities like creation and publication of tenders online, enable tenderers to view tenders, submit their requisite amount and bid offers online. This new Portal will lead to the reduction in hassles related to tendering process, saving in cost and time, increase in ease of working, increase in efficiency, increase in competition, reduction in the complaint related to tendering and easy access to information. In order to bring transparency and efficiency in tender process for carrying out Works Contracts of Indian Railways, Minister of Railways Shri Suresh Prabhu Inaugurated and Launched Works Module of Indian Railways E-Procurement System (IREPS) and Implementation of e-Tendering in Works Contracts developed by the Railways in association with Centre for Railway Information Systems(CRIS), an IT arm of Ministry of Railways. Chairman Railway Board Shri A.K. Mital, Member Engineering Railway Board Shri V.K. Gupta, Financial Commissioner Shri S. Mookarjee, Member Traffic Railway Board Shri Mohd. Jamshed and Member Mechanical Railway Board Shri Hemant Kumar, Shri. S.S. Naryanan Additional Member Civil Engineering and other Railway Board Members, senior officials from Railways Board and CRIS were also present on the occasion. The Proceedings of the function were conducted by Shri Alok Kumar EDCE(G)/Railway Board. The vote of thanks was proposed by M.D. CRIS Shri Sanjay Das. The inaugural ceremony was accomplished by Railway Minister launching one tender for construction of washing line with catwalk and pit at Varanasi Station and other miscellaneous works in connection with Varanasi yard remodelling work. Speaking on the occasion, Minister of Railways Shri Suresh Prabhakar Prabhu said that this is an extremely important step towards IT enablement of Indian Railways. He said that this commendable work just not only confined to the Engineering Department alone but it is comprehensive efforts of all. He said that except Indian Railway no other organization possesses such transparent process for finalizing tender process. This major step does not only result into saving of time but also brings transparency at global benchmark. 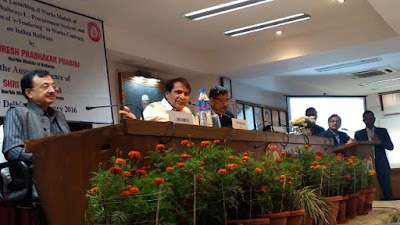 Stressing on digital India concept, The Railway Minister stated that at presently more than 60 percent railway tickets are being purchased online through IRCTC. He said that this E-Connectivity will bring huge benefit as the transparent process will bring people closer to the Railways. At present, Railways deals with approximately 25,000 tenders involving an expenditure of above Rs. 35,000 Crores for maintenance/upgradation of existing assets and creation of new assets for huge railway network of about 66,000 Route Kilometer, which is handled manually. This Portal will enable railways to implement e-governance in Works Contract with facilities like creation and publication of tenders online, enable tenderers to view tenders, submit their requisite amount and bid offers online. It will also facilitate the instant online creation of comparative chart and briefing note. This new Portal will lead to a reduction in hassles related to tendering process, saving in cost and time, increase in ease of working, increase in efficiency, increase in competition, reduction in the complaint related to tendering and easy access to information. This portal has introduced few new concepts like online creation and maintenance of SOR (Schedule of Rates) and Non-Schedule directories, standardization of tender conditions and interactive documents and better document management system. This Module has been developed by Civil Engineering (General) Directorate through CRIS. In view of enabling e-governance and transparency in Railways, it was decided to implement e-tendering in Works Contract. Indian Railways is one of the largest rail network in the world with about 1,16,000 track kilometre, 66,000 route Kilometer, 1,39,000 Bridges, 26,000 Km electrified routes, 8500 stations and about 6 lakh quarters. The maintenance upgradation of existing assets and creation of new assets needs a huge involvement of Works tenders. This involves approximately 25,000 tenders worth Rs. 35,000 Crore on Indian Railways. This huge volume needs an involvement of about 10,000 Railway officials and 20,000 bidders. Manual handling of huge volume of tenders has its own shortcomings like being time-consuming, lack of uniformity, constraints on bidders in submitting their bids etc. To increase the efficiency and bring more transparency in tendering system, e-tendering in Works Contract is being introduced through newly developed IT applications. This Application will go a long way in increasing efficiency and effectiveness of Indian Railways system. This application will facilitate all tendering departments of Railway viz. Engineering, Mechanical, Electrical, Signalling & Telecom, Commercial, Health etc. Work from the comforts of your office / home and Choose time as per your convenience.